Homepage. This page: An unused letterhead from the late fifties showing a coachbuilt Bedford coach. Gosling's of Mareham-Le-Fen near Boston, Lincs. 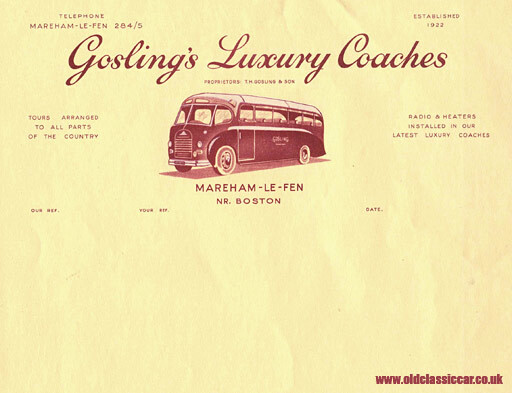 If you lived in the Boston (Lincs) area, and were looking for luxury coaches to hire, then perhaps Gosling's of Mareham-Le-Fen, would have been worth giving a call (Telephone Mareham-Le-Fen 284 or 285). This unused letterhead must date to the mid/late 1950's, and features an illustration of a Gosling luxury coach - quite possibly a Bedford SB with Plaxton bodywork. Tours were on offer "to all parts of the country", and proprietors T.H. Gosling & Son were proud of the latest mod-cons in their coaches - radios and heaters were standard fitment in their vehicles. This well-established firm was founded in 1922, but despite their longevity I've yet to find any information on the company or its vehicles. Does anyone remember this coach operator?